During sports season (which happens to be 9 months out of the year) we do alot of traveling on the weekends. On those weekends we can have 4-6 games depending on the schedule. Crazy isn’t it!? Anyway, eating healthy and staying on budget has got to be purposeful or it just will not happen. 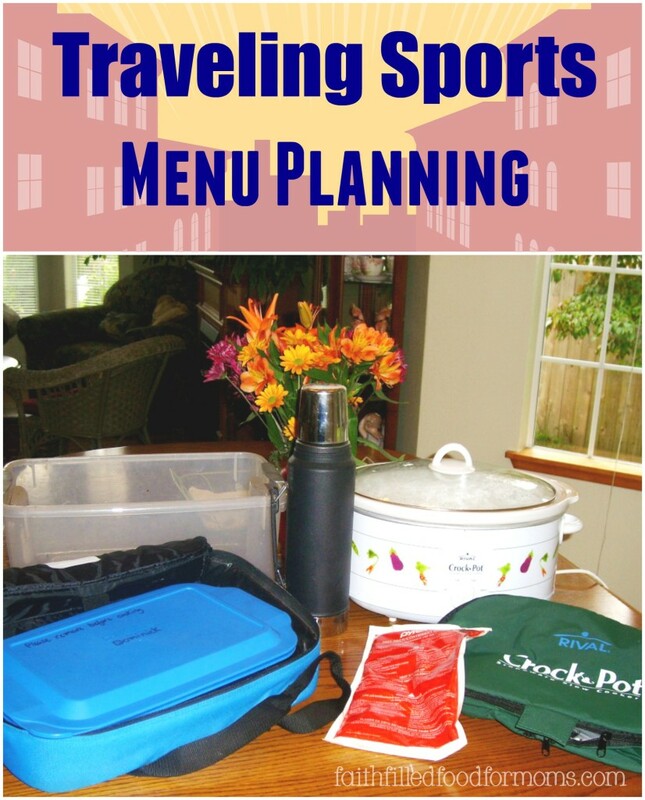 That is why I created a traveling sports menu plan with free printable planner for staying organized and saving hundreds! You can save Thousands this year with these other creative money saving tips! 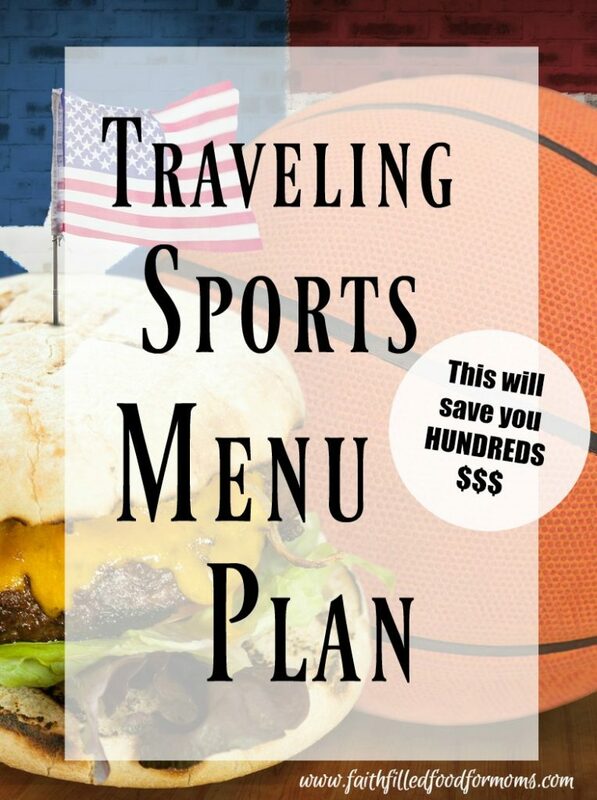 Use these sports Mom hacks or it’ll be easier to drive through a fast food joint in between games than to plan and prepare for your trip, but it will break the bank AND it’s not very healthy. 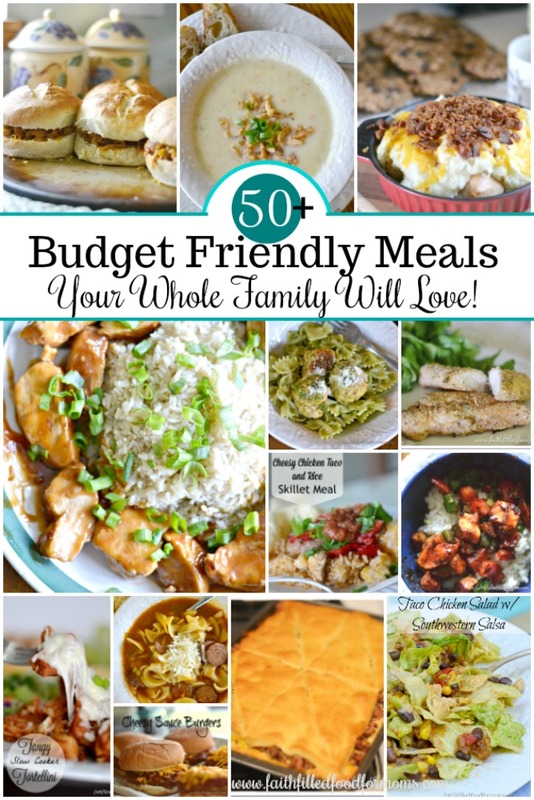 Use these meals for road trips and the whole gang will be happy and healthy! 2 What are good snacks for sports? What are good snacks for sports? Sub Sandwiches – Chicken, Bacon Ranch, Veggie, Ham and Cheese (hot and melted Mmm) I keep the ones I want hot in my casserole dish that has a heat pack and a lid…first I wrap the sandwich in foil. It keeps them warm for hours. Breakfast Sandwich (ham, cheese, egg) I keep hot the same as I explained above. Easy BBQ Chicken Sandwiches ~ These are sooo delish and can be kept either in the 9×13 with a lid OR take along in the crockpot! Yogurt Parfait’s with lots of fruit and granola ~ use the little plastic mason jars with screw on lids from below ~ PERFECT! 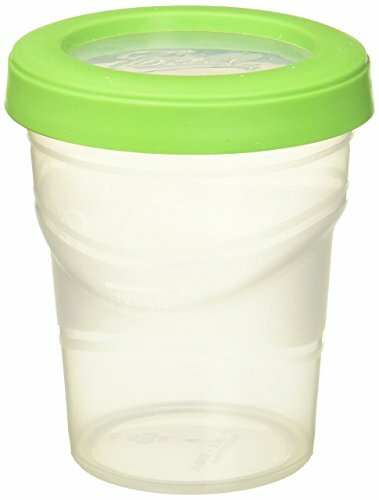 Fruit and veggies like apples with peanut butter dip or caramel dip Use the plastic cups with screw on lids for this too! 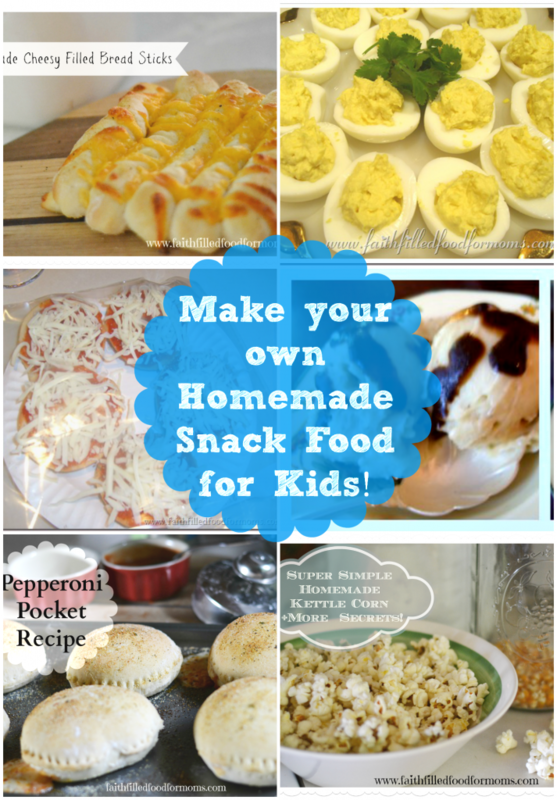 For more easy snacks ` Check out our recipe page! I LOVE to take my Crockpot along on our trips that take a whole day. It’s so nice to escape the crazy gym and go out to the car and have a nice healthy meal…quietly. Bring paper bowls and plastic spoons and a garbage bag and boom…you’re ready. It’s also fun to invite others from the team to join you too…trust me…you will be the hit of the team with both parents AND athletes if you bring a Crockpot full yummy food. 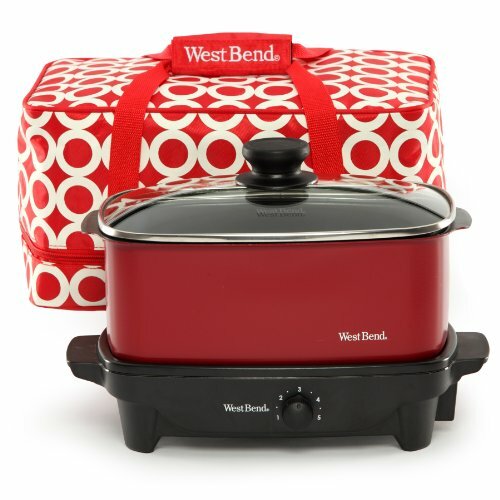 It’s super important to have a Crockpot with a cover for these trips to keep your food hot. 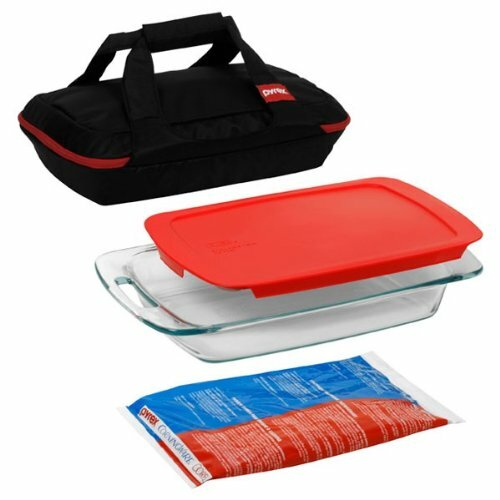 Pyrex Portables 4-Piece Glass Another of my prized possessions 😉 is my 9×13 pyrex with a cover AND carrying case w/hot pad that you can microwave to keep the contents hot! I use this for casseroles BUT when I’m using it for my traveling menu, I put sandwiches, burritos …anything in it that I want to keep hot. People ask me about this all the time, because it works so well! The MOST IMPORTANT thing we bring– Coffeeee! 😀 My husband and I are coffee drinkers and we have saved sooo much money by simply bringing along our own coffee. While everyone else is driving through coffee stands at $4.50 a drink…we are spending pennies! Oh is that too boring? 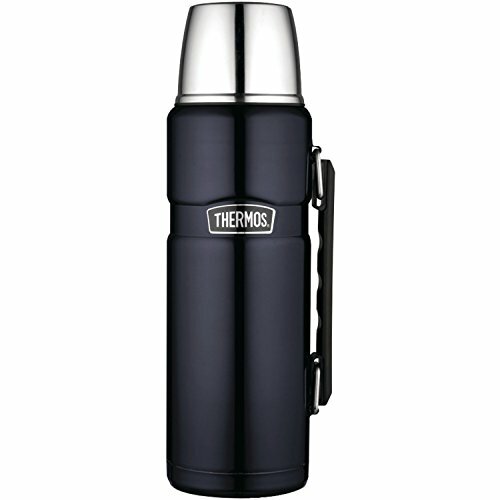 You can make your own fancy coffee drinks and put them in a thermos too! 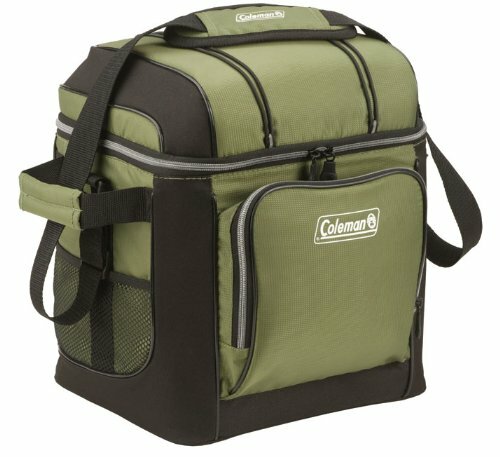 Coleman 30 Can Cooler, You need a good cooler for keeping stuff cold…I’m pretty sure I don’t need to explain why. old bin to put our dirty dishes in so that I can just carry them in the house when we are done and throw things in the dishwasher. These little plastic jars with screw on lids are PERFECT for having yogurt and fresh or frozen fruit parfaits! Bring some granola in a ziploc bag and boom…nope you don’t have to drive thru McDonalds! Oh and that old bin on the table is for garbage and dirty dishes. Plop everything in it, stick it in the trunk and unpack when you get home! NO MESS! 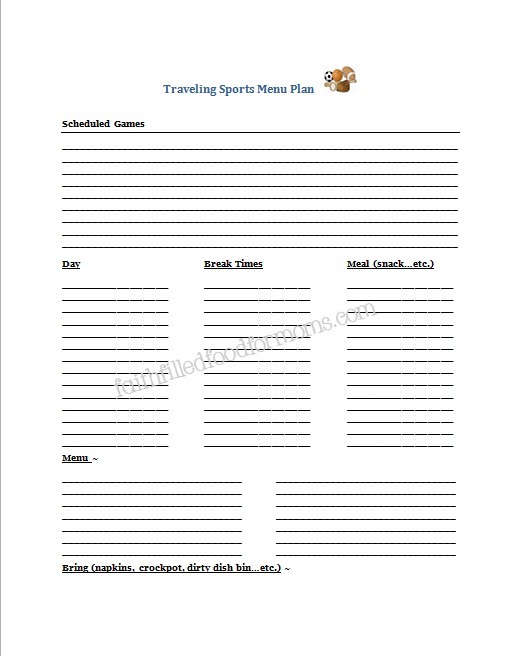 I wanted to help you be able to plan ahead, so I created this printable for you to use when you have your schedule of games or extra curricular activities. « How to Save at the Grocery Store With Loss Leaders! Great tips for every busy family! Thank you for sharing on the Brag About It link party! As a hockey mom I truly appreciate this post! As a mom to the boys on travel baseball teams and basketball I LOVE this post! Thank you! This was a great read with lots of helpful tips. Thanks for the encouragement! You are so welcome Charity, I’m happy it was helpful! Thanks for stopping by and taking the time to comment! Blessings! Do you plug your crockpot in somehow in your car? I’m confused by this. Or does the food just stay warm in the crockpot even though it’s not plugged in. Thanks for the clarification. Hi Meredith! Great question. No I don’t plug into my car. I’ve used my crockpot several different ways. If I know that we will be at a certain venue for the day I will find an out of the way corner and plug it in so that it cooks all day at the venue. It must be very out of the way though. Another way I’ve used my crockpot is to have already cooked in it the day before and then left it in the crockpot in frig. overnight. Then in the morning I’ve reheated either in the crockpot or on the stove (depending on what you made) This only takes about 10 min. Then I pour it back into the crockpot and heat the whole crockpot up by turning it on for about an hour so it’s good and hot. The inner part of my crockpot removes from the outer part, so then I remove and put it into the warmer. It will stay warm until lunch time almost always. You definitely need to know game times and venue to make the crockpot work for you. We’ve done this many times though successfully! We travel 1-2 weekends a month for sports also. But we are often in a hotel. For the long weekends (2-3 nights), I try to bring my “travel kitchen” to the hotel. I have an electric skillet that I can use to make sandwiches, soups, pasta, reheat leftovers, etc. I have been known to bring a hotpot for easy heating of water and some soups, and I have brought a toaster too. Sometimes our hotel doesn’t include free breakfast,or we have games really early and we can’t catch their breakfast. It is easy to make toast,bagel, pancakes, French toast, or eggs, etc. I just have to be mindful of the smoke alarms and not cook smoky things (like a cube steak I made once which was amazing, but put off a lot of steam. I put the skillet on the bathroom counter to avoid setting off the smoke alarm or something. I also check to see if the hotel includes a mini fridge or microwave for when I plan my hotel menu. Awww I’ve done that too Bobbi! For the long weekends we used to get a hotel with a kitchen if possible. A couple of times to save money we rented a cheaper room with no kitchen I brought a toaster oven but the smoke alarm went off Whooops! Didn’t do that anymore! Great idea to do it in the bathroom though! Thanks for sharing your great ideas!